I first got into welding when I was going to art school. A friend of mine asked if I wanted to take a metal sculpture class with him. I did and I loved it. Playing with fire and melting stuff and working with metal is awesome. Around that same time, my GT Backwoods stolen when I was still living on campus at UMass Amherst. The thief had panted the bike neon green with a brush. So when I got the bike back, I had to strip the paint. When I did that, I noticed all these beautiful little TIG welds. And it just connected in my head that someone had to weld the bike, I loved bikes, so I wanted to do that. A Ti Hampsten in the works. A friend of mine from school got a job at Merlin bikes in Cambridge, MA. I kept in touch with him and wound up moving to Somerville and got a job at Merlin. Initially I was doing finishing and shipping and whatever they would let me do. The company was pretty big back then. There were 40 people and it was full on factory production building. I went there with the intention of being a welder and got to know the head welder, Tim. After work, I would have Tim sit over my shoulder and yell at me while I tried to weld. Eventually I got good enough that I started working as a production welder. I did hundreds and hundreds of brake bridges. Then seat tube assembles. Then front ends. You got to move around the frame as you got better. I was there for three or four years. Then Seven got going in 1997 and a bunch of people from Merlin left to work there, including me. Seven is all custom, so it was a completely different set up for production. It’s all single-piece flow. Still is. I learned a lot about production working there and got to do a lot more welding. I probably welded 2,000-3,000 Sevens, mostly titanium and some steel. I was doing two-three frames per day for eight years. There was also some frame repair—assessing damaged frames and cutting out tubes and machining new ones to put in. I really got into the guts of frame building there. What brought you out to Seattle after leaving Seven? 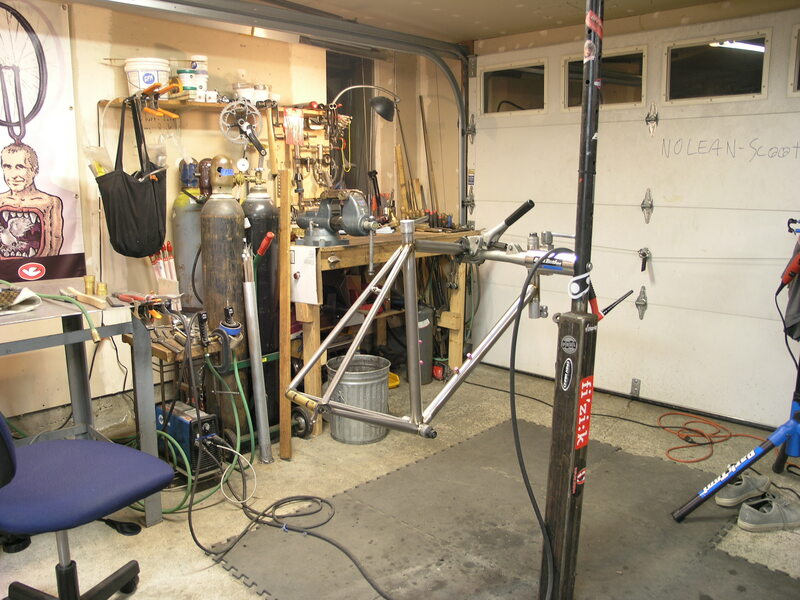 I came out to Seattle in 2005 to get away from bicycle building. I was burnt out. Working in production mode is a great way to learn. You get really good at frame building. But I’ve never seen myself in that kind of environment. I always thought I was going to be an artist; a painter or a sculptor. It was actually kind of a conflict while I was working at Seven. I was still trying to be a painter. I was welding all day, then painting for as long as I could at night. It was kind of tough. So I said screw it. I had some connections in Seattle and moved out here. I got a really great job at a place called Gulaasa and Company. I was building great metal furniture and architectural stuff. It had a whole bunch of different processes and machines and metal working techniques. I got a huge education there. I was at Gulassa for three years. Then the place started falling apart and went out of business. I don’t think I’d have been able to do what I’m doing now if I hadn’t had that experience and that break from bikes to give me a fresh perspective on things. I learned how to make fixtures and tooling and use machines in all kinds of different ways. How did you get back into frame building after Gulassa? I actually made a few frames for myself when I was at Gulassa. There were so many machines there, you could basically make anything you wanted. It was a really well equipped shop. I came up with a brand name, Bird Fabrications. I still have a business license for it. Then Bernard (Georges) came into town. I knew Bernard from working at Seven. He moved to L.A. a couple of years before I moved here. Then he moved to Seattle around 2008. He wasn’t sure what he was going to be doing, so we decided we were going to make some bikes. Both of our favorite lucky number was 333 so we called it 333 Fab and got to it. There was a NAHBS show in Portland coming up four months from then, so we decided to give it a try. In the meantime, we’d bumped into Steve Hampsten in town and he said had a shop we could use for free. Everything just fell into place. We didn’t have to get investor or a big chunk of money. Basically just a lot of time and little bit of money for tubing and some other stuff to make frames. But most of it was already in Steve’s shop. Steve was just awesome about opening up his shop to us. That led to me having a really good relationship with Steve and now I build for Hampsten most of the time. Are you doing most of the fabricating for Hampsten? Pretty much all of it. Except for the lugged bikes, I don’t do lugged bikes. Another guy, Martin Tweedy does those. He and Steve know each other from their time at Match, which was a Seattle-based bike company back in the 80s and 90s. Steve did a lot of brazing stuff and Martin did frame building. He does awesome work. I’m not really into lugged bikes, myself. I think they’re really cool, but it’s not my style of building. Racing Starcrossed in Seattle on one of the early 333 bikes. Photo by Dave Roth. And you also build Ti bikes for Davidson on the side? I just weld Ti bikes for Davidson. Will (not to be confused with Bill) is the main fabricator over there. He does all the lugged building, all the steel building, and does all the machining and other work for the Ti bikes. He tacks them together and hangs them up, then gives me a text to come and weld it for him. Between 333, Hampsten, and Davidson, I’m doing bikes full time. I feel really fortunate to be able to that. Especially with basically no money down. These last few years were super tough. You could not get a loan to start a business like this. It’s not a very profitable business. I just make enough to get by. So, you launched 333 in 2008 as our economy was starting to tank. Was it slow getting the company off the ground? Oh yeah. And it’s never been fast. We haven’t made that many bikes for 333. It’s a really local company. We had high aspirations because we know how to make bikes, but there are lots of people who know how to make bikes. And honestly, a lot of them are better at marketing bikes than making them. I could get myself in trouble with that line, but looking at a lot of new builders, they just went to UBI then started a bike company. That’s super ambitious and it takes a lot of courage to do that. But man, there’s a lot of things that you learn over the years that you can only get through doing them over and over and over again. It seems like the newer generation of builders are mostly learning by taking classes as opposed to an older generation that learned with an apprentice model, especially in New England where a lot of guys came up under Fat Chance and others. What do you think about the old way of apprenticing in a shop versus taking a week- or two-long class then selling bikes to people? It worked for me. You see a lot more. You handle a lot more. You see how production systems work or don’t work. Merlin was it was a heavy inventory-based system. We’d do 10-20 bike runs. The production schedule would be like, 20 53cm road bikes this week. You cut all the tubes at the same time. 20 top tubs, 20 down tubes, 20 seat tubes. Then do all the assembly. Apprenticeships give the builder a solid base to work from. So, sure you can go to school and get taught the basics, but I don’t think it’s responsible, in a way, to put bikes out to consumers without a lot of experience under your belt. I hear all kinds of nightmares. There are so many ways to screw up a frame. And until you’ve done hundreds of them—until your stuff has enough time to go out there and fail or not fail–you’re not going to know that kind of stuff. In an apprentice system someone else is over your shoulder teaching you and helping you avoid problems. At the same time, because there are so many builders, frame building’s becoming more of a cottage industry and it’s become more regional. And that’s really exciting. In some ways it’s brought more passion to the industry. People want to get really involved. People want to make stuff and that’s awesome. I want to see more people making stuff. In a somewhat similar vein, a lot of builders choose to build under their names. They are the company. Whereas for you, people might not know Max Kullaway, but they know 333 and certainly know Hampsten or Davidson. How do you feel about being a builder behind the builder; having your welds out there, but not necessarily your name? I’m not too hung up on that. It’s fine by me that it’s not my name out there. To me it’s about the bike, it’s about the product. Though sometimes I go back and forth on names. 333 is now just my company. So I’ve been mulling over whether I should change it to a different name or make it just my name or something else. I’ve been driving myself a little bit crazy with that. As far as Hampsten and Davidson go, I’m just happy to be building bikes. It’d be great for every bike I build to be 333, but I’m also aware of some of my shortcomings, like not being great at marketing. I feel like my time is best spent actually doing the building. There’s a good rhythm to physically building stuff and when that gets chopped up by answering the phone or posting stuff on Facebook or dealing with the website crashing, it ends up wasting a lot of time. I still like having some kind of interaction with the customer, though. It was something I missed when I was at Seven. You know who you’re building the bike for; you get a sense of who they are. There’s a relationship there and that’s a really nice thing. Steve and I work really well together. He lets me build, he sells stuff, he keeps up with the blog. Right now 333 is separate, I have to do all that stuff. But we’re trying to figure out what’s next with that. So what is next for 333? There are some things in the works. I’m probably going to be doing more with Steve and Hampsten bikes. That’s what we’re talking about right now. Looking at the future, I want to be able to retire one day, or slow down and not just be a poor frame builder. Some of those big questions are getting closer to reality and I’ve got to be honest with it. I’m trying to be strategic and see what I can do or what Steve and I can do to help that process. I want to work with Bernard some more too, so I need to come up with some kind of scheme to get him away from his metal fab job. I really like working with Bernard. He’s a really good friend. So far things have worked out for me. But I’m a self-employed person and it can feel kind of sketchy sometimes knowing there’s only three months of work there. Then you just have to hope more orders come in. It’s a tenuous existence at times. The hard truth of it is most people fail in this business, so I feel really fortunate that I’m able to build bikes for a living. It’s not a path I would’ve chosen, but I’m happy it worked out that way. 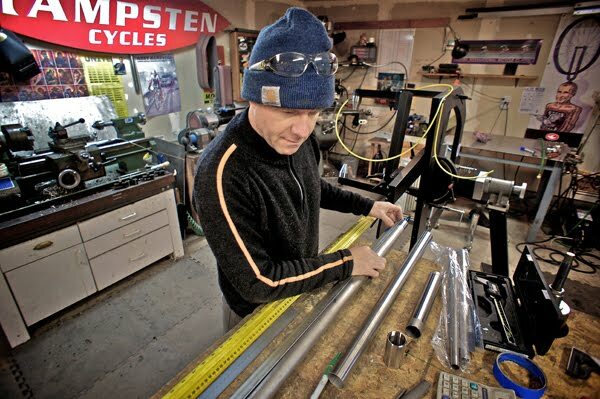 This entry was posted in Bike Industry, Frame Builders, Interviews and tagged 333 fabrications, bill davidson, custom frame building, Cyclocross, hampsten bikes, HUP united, seattle bike builders, steven hampsten. Bookmark the permalink. Evidently Max will be welding my Davidson in the next few weeks! Thanks for hi-lighting more of the local frame building scene. Love your frames Max! 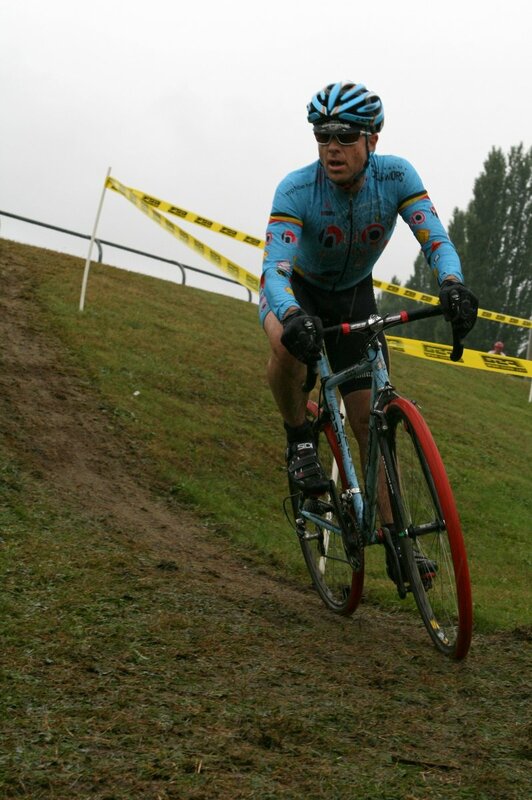 Especially my 333Fab Cyclocross bike! Max, good to see a story on you [I was just telling my current student about you this week]! Keep up the great work. After a good test ride of my friend’s Hampsten( the pistacchio LDV that ended up in the province of Québec) I can say that this bike is a thing of beauty and a labor of love, no less! Keep up the good work Max. I recently interviewed Max for an article I’m writing about cyclocross bike geometry. He really has a deep knowledge of bike geometry and how all the parts fit together. Not an easy subject to master! And he’s great at explaining it. I visited Davidson for the first time yesterday, he took me in back to see the operation. BEAUTIFUL WELDS!!!!! Change your name to Kullaway, cool name first of all, but if you want to market, have your name follow you every where you go. You never know when you fully go out on your own building your own line, if your name is out there people will gravitate to you for sure!!! Example if Davidson says 333 welds the frames, as you said no one associates that with you. If they say Kullaway does, it is more personal, people want to know who this person is, 333 sounds to big and impersonal. As you know custom bikes is about being personal. Keep up the good work.